Versatile, efficient guardrail systems that exceed all OH&S guardrail regulations that are reusable, easy to install and creates a professional image on the worksite. 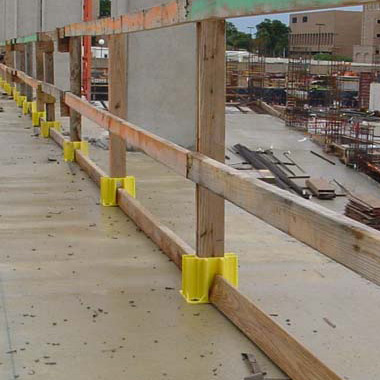 The Safety Boot Guardrail System allows full guardrail sections to be moved from floor to floor easily and without reassembling each individual section. Long stretches of dependable guardrail systems are possible with the Safety Boot. Proactive safety solutions are essential on large project sites where many workers come and go daily. The Safety Boot provides edge protection as well as protection for stairways, walkways and corridors. Commercial contractors depend on the durable Safety Boot to meet their most challenging temporary guardrail situations. Job Site Safety Is Our Business.